Cap City Repro offers a number of options for professional and DIY interior designers seeking custom wallpaper solutions for their decorating projects. Our custom wallpaper is printed with UV cured inks that are solvent free, washable and will not fade. 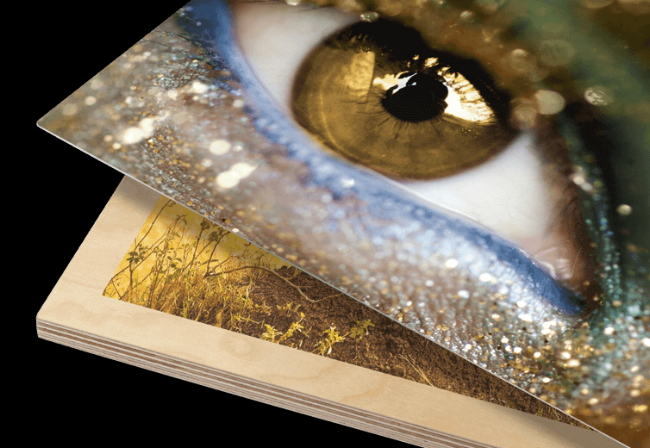 Cap City Repro's wall deals are images or graphics printed directly onto an adhesive, opaque vinyl material. Wall decals are able to be cut to shape, have unlimited color options, and come in a wide range of sizes. Custom wall decals are a great option for office, business, and retail walls as well as home décor. Custom floor graphics from Cap City Repro are a creative way to grab attention. With our custom floor graphics, you can make a dynamic impression. Floor graphics can be used for retail, trade show or for an impressive highly customized home interior. Get custom printed fabric at Cap City Repro with your own design and create a unique fabric for your project. Use our UV coated, water resistant poly/ cotton blended fabric for draperies, upholstery and more! Cap City Repro offers museum quality printing and photo mounting services for fine art and digital photo reproductions. We print and mount photos and fine art on acrylics, metal, wood and gallery quality canvas stretched on bars made in the USA! Let us make a perfectly printed reproduction for your business, home or office. For highly custom interior décor options trust the short run print and design team at Cap City Repro. We care about what we do and it shows in the quality of our products. Starting for as little as $350.00 you can add a repeating logo backdrop to your visual marketing toolbox. Use Our Artists Web Page to Promote Your Art and You! Over the last 15 years as Capital City Reprographics has evolved from a blue printer serving the construction trades to a color small and wide format digital printer, the staff here has had the opportunity to work with all sorts of artists. Our artists run the spectrum from those that think of themselves as amateurs to those who are working full time and consider themselves as professionals. We've been able to help them scan their original works and reproduce them digitally in all sorts of sizes and on all types of media. Small format reproductions like note and greeting cards and different types of calendars. And from large format Giclee prints on watercolor paper, canvas and bond to our recently added acrylic, metal and textured substrate prints. It's been fun to help our artists try new things and see them succeed in maximizing the value of their original works. To further support and showcase our artist’s clients, we thought we could help by creating an area of our web site just for them. That lead to the creation of the “our Artist” area of capcityrepro.com. We have web pages that showcase some of our artist's work, include a small biography as well as links to their own websites, galleries or events where their work can be found. This is not something that we charge for. Cap City Repro’s staff does it because we enjoy seeing our artists and their work get as much exposure as possible. So take a look! If you are one of our artists and were not aware that we offered this service, please let us know we will work with you to gather the content we need to showcase you on “Our Artists” page! A businesses customers tend to view that business through the lens of the one service they use. Our blue print customers think of us for technical printing and not for fine art Giclée prints on canvas and water color paper. Conversely our Artist and other business customers probably don't realize we have been supporting Architects, Engineers and Contractors for over 75 years! At Cap City Repro, we provide ADA-compliant signs that have been produced specially for your company based on your design ideas and choices. 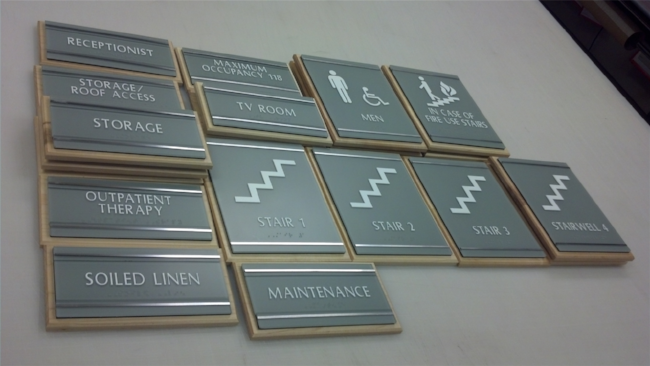 Let us help you design ADA, braille, and tactile (raised image) signs, as required by the Americans with Disabilities Act, that are necessitated by law to be placed in specific locations throughout your buildings. Excellent for indoor and outdoor use, aluminum signs are durable, stylish and affordable. An aluminum sign is lightweight, making it easy to mount or hang. Aluminum is resistant to harsh weather (heat, humidity and snow) and naturally rust-proof, water-proof and chemically resistant. 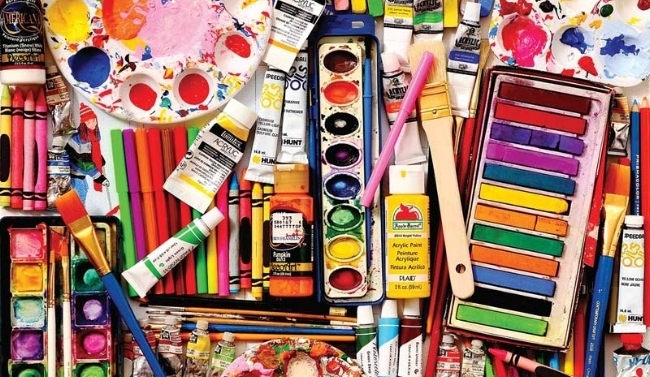 We serve today's and tomorrow's needs for graphic arts, drafting and fine arts products. Cap City Repro is a retail distributor of Silver Lead and Alvin drafting supplies and drawing equipment, fine art materials, hobby and craft supplies, office and stationary products , and drawing room and studio furniture. Get your message out there with affordable, eye-catching banner stands from Cap City Repro! Whether for a critical trade show, a busy promotional event, or any other advertising venue, here's where you'll find the perfect banner stands that get your message seen and remembered! Keep workers, passersby and traffic in and around your construction zone safe at all times. Create an accident-free work zone with construction site signs. 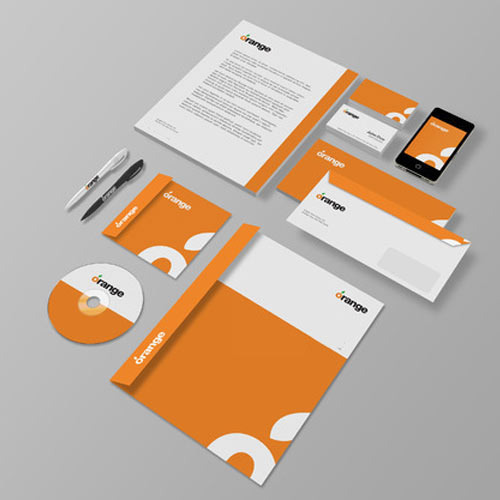 Let Cap City Repro's Design Team work on promoting your brand image. Our custom printed dry erase boards, magnetics and panels all have a very smooth, clean dry erase writing surface that won't ghost and erases great every time. We can print full color images or in black and white. Flex Flags feature a full fiber pole and wind-resistant flag offered in several shapes. For indoor or outdoor use, the flexible design allows the graphic to rotate in the wind. Flex Flags come in your choice of single or double-sided and is offered in four shapes - Feather, Straight, Teardrop and Edge. Cap City Repro offers top quality, durable and removable custom floor graphics for any type of flooring surface. Labels range from a simple lapel label to a 4-color process laminated label. We produce Decals for a variety of industries and multitudes of applications! With our selection of materials, print methods and adhesives, we can find a solution for your needs. Our products can be used for point of purchase applications, political campaigns, special events and a variety of other functions. Magnetic Signs are the perfect way to advertise your business and easily make a big impression. Our magnetic signs are printed with latex inks for outstanding quality and are easy to apply, remove, and reposition. Mesh Banners are digitally printed in full color. Mesh is an outdoor banner material that is used in high wind locations instead of wind slits. Great for fence applications! Cap City Repro is a Reprographic Services Association authorized paper supplier. We stock and supply a wide range of papers that are suitable for many commercial and consumer purposes. Immortalize your favorite photo or fine art piece on Acrylic, Wood, PVC, Aluminum or Stretched Canvas. Let Cap City Repro produce a step and repeat banner for your next big event. This high quality custom backdrop ensures perfect photos every time. Cap City Repro offers Printed Trade Show and Event Table Throws and Table Covers that make a visual impact and compliment your Display Accessories. Cap City Repro offers one of the widest ranges of portable display products, fabric structures, modular exhibit solutions, display accessories and related graphics. From portable signs, popup displays, tension fabric displays to literature racks, lighting, display cases and more, Cap City Repro is a one-stop-shop for all types of exhibit and display solutions. Vehicle Graphics are a great way to advertise your business. It is like a moving billboard, and is very effective in capturing attention. Enhance your windows and give them a premium look with custom die-cut Vinyl Window Lettering. Cap City Repro's Vinyl Window Lettering decals are custom cut in any color or font. Cap City Repro's custom wallpaper is printed on Low-Tac Fabric Wallpaper with UV cured inks that are solvent free, washable and will not fade. Ideal for indoor finished surfaces such as drywall, plaster or paneling. Also available contour cut to custom shapes up to 50" wide! From wall frames to self-standing pylon directories and everything in between, Cap City Repro offers the directional indoor signage your architectural projects need. Our large product line includes wall signs, projecting signs, directories, suspended signs, triangular signs, towers, pylons, desk signs, poster frames and much more. Cap City Repro's web development team can help you craft an elegant web design that fits your brand. We offer website solutions including domains, hosting and continued site maintance. We offer custom printed perforated and dual-view window graphics for advertising on your storefront, car or truck. Sure to grab the attention of your customers! Our custom yard signs provide a cost effective way to get your message across. Each yard sign is composed of 4 mm corrugated plastic that is direct printed with the latest technology UV inks. Also available contour cut to custom shapes. Just ask us and you will be surprised at what else Capital City Reprographics can do to support you! What is a Giclée print and how can you use it? Giclée is a term on current common usage in the print industry to describe a high quality fine art reproduction of either a physical original or a computer generated work of art. It can be printed on a number of different media types like coated papers, water color papers with texture or even canvas. These prints can be mounted, stretched and framed. Some artist will sign and number their prints. Others will enhance their Giclée with paint or other media creating an original work based on the print. Giclée printing is not reserved for just fine artists. In this age when it seems everyone has a high resolution camera in their pocket or purse, you can use this printing technique to produce your own works of art from your favorite images. You can crop, color correct or add a filter to that image and have it printed any size easily up to 5 feet wide! Jack Duganne, a print maker working on the west coast is credited with coming up with the term Giclée. He was said to have been looking for a way to describe high quality inkjet prints without the poor quality connotation that 4 color inkjet printing implied. He settled on the term Giclée. A simple translation means a splash or spurt of liquid. Thus, a term for high quality digital reproductions was born! If you have any questions about turning your photo or artwork into Giclée prints on paper or canvas please contact us at (517) 482-5431 or email us by using the LEARN MORE link. 3 Great Canvas Print Gift Ideas for Mother's Day! We all know that incredible feeling of elation we get when we give Mom the perfect gift. Capital City Reprographics offers the ultimate in the gift giving experience with our hand stretched Giclée prints on canvas. We can use your favorite digital picture, or our team of expert graphic artists are able to scan and reproduce her favorite conventional photos as well! 1. Single Canvas Print - The best means to create as well as transform a favorite photo into a striking piece of art for display is to make a canvas print from digital pictures. Display Mom's favorite photo on a stunning custom canvas print. 2. Multi Canvas Print - The key to selecting photos for a Multi Canvas gallery wall is to show consistency in theme. The collections will look cohesive, not cluttered. Try using photos where the backgrounds feature similar color palettes. 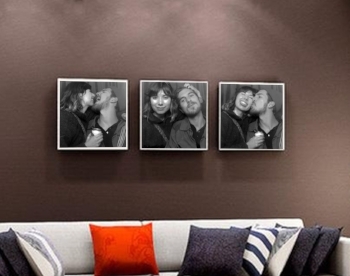 Add depth to Mom's walls with a split-style gallery of memorial photo canvases. 3. Canvas Collage - Bring all of Mom's favorite photos together for a distinctive arrangement in a Canvas Collage. Try combining photos of loved ones celebrating birthdays, enjoying vacations or relishing occasions both big and small. Turn those precious memories into wall art Mom can enjoy from the comfort of her home everyday! For museum-quality digital photo printing on canvas at great prices contact Capital City Reprographics. It is our passion to help bring your photos to life as canvas wall art. Let us help you make a gift for Mom that she will cherish for years to come!